From the moment we arrived at Clouds Estate, we were swept into a different world, one where we were treated like royalty. We were very warmly welcomed by the manager and escorted to the patio/garden area for a complimentary glass of bubbly (MCC). Our luggage was taken from our car straight to our room, which was elegantly finished with a luxurious king size bed, modern furniture and state of the art technology. 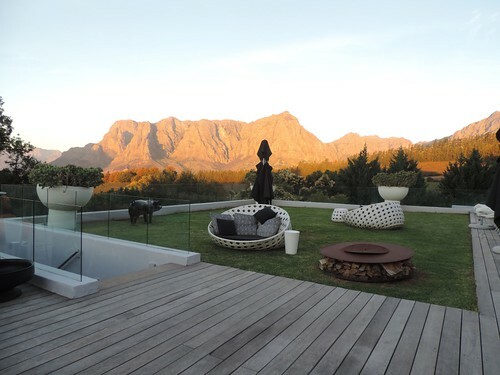 The floor to ceiling glass sliding door opened up onto the most breathtaking view of Simonsberg with the autumnal colours of ruby red and burnt orange permeating the Banhoek valley that stretches out towards Franschhoek. A deep sense of peace seems to settle on you here, perhaps facilitated by the building’s unbroken marriage with nature, or the wonderful way it plays with natural light in its use of glass and clean wooden lines. Sunlight seems to filter through the building creating an ever present view of the sky and wispy clouds above. The Boutique Hotel consists of a main building hosting the reception, restaurant and some hotel rooms. The front lawn has a stunning infinity pool and there are various sun loungers, sofas and seating pods for guests to relax in. Modern art sculptures in the garden offer a playful yet artistic touch. 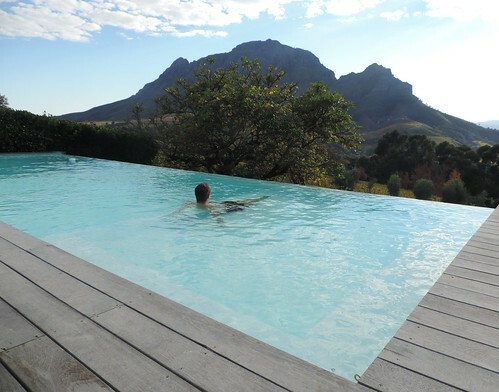 Several self-catering villas are also dotted around the estate offering privacy and luxury in good measure. The villas have a shared pool area. Our dinner in the restaurant was absolutely delicious. I had the French trimmed rack of lamb with carrot puree, roast baby carrots, peas and juis and my husband had the fillet of beef. For desert we had banana and chocolate spring rolls and passionfruit panna cotta respectively. The Clouds Shiraz was the perfect accompaniment to what was an absolutely beautiful meal. Our breakfast was equally delicious, enjoyed on the sunny veranda outside. 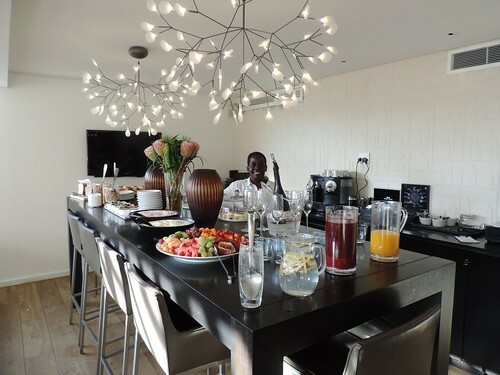 A great continental buffet selection was followed by a cooked breakfast of our choice. 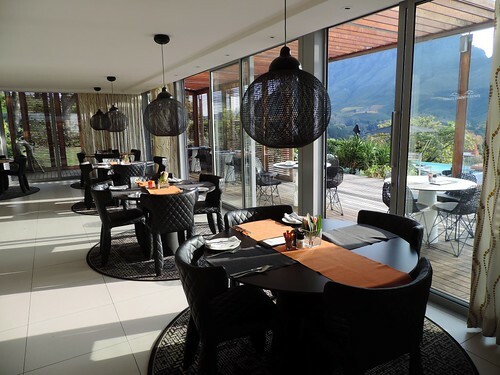 Clouds is a child-free hotel and as much as we adore our two children, places like this offer the perfect opportunity for complete and total relaxation. It is so different from the hustle and bustle of family life that you can’t help but be transported and rejuvenated. For tourists to our beautiful country I can’t think of a place that advertises the exquisite beauty of the region, as well as our warm South African hospitality, in a better way.